As we all know, the Mac mini comes with no disc drive and that means you cannot play DVDs on Mac mini. Luckily, there are always solutions to solve the problem. If you're interested in enjoying DVD discs on Mac mini, read on for details. This article lists 3 ways for you to get DVD and Mac mini to play nicely. In order to play DVD on Mac mini without optical drive, you can buy an external disc drive. Apple USB SuperDrive is specially designed to burn/play DVD on Mac without drive and fully compatible with Mac mini (late 2009) and later. It's slight and simple to use. It connects to Mac mini with USB cable included into SuperDrive and then you can watch DVDs on Mac mini. The Apple USB SuperDrive is $79.00 at its official site. There're many other good disc drives like Apple USB SuperDrive for DVD playback on Mac mini, such as LG Electronics 8X, Liteon EBAU108, Dell DW 316, Transcend Portable 8x, to name a few. It has some advantages and disadvantages to buy an optical DVD drive to play DVD on Mac mini, compared with other two ways. Ability to burn DVDs, simple to operate. Only work on Macs, cannot play/burn Blu-ray discs, users have to carry the drive around in order to play DVD on Mac mini. You can play DVD on Mac mini by using Remote Disc feature that is designed to share a CD/DVD drive between Macs. To fix DVD won't play on Mac without disc drive, Mac mini users need another Mac with optical drive or a Windows PC that has installed DVD sharing setup, and connect them into the same network. 1. On the Mac Mini that has an optical drive, choose System Preferences from the Apple menu. 2. 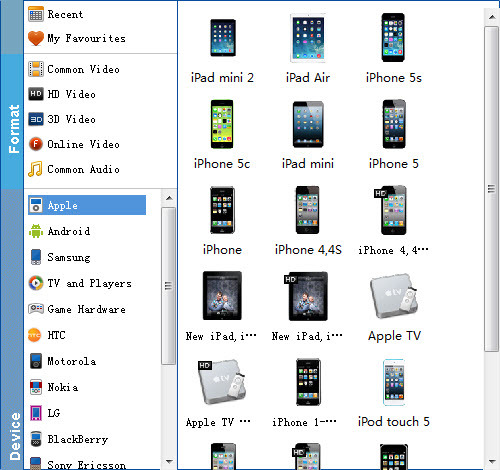 Click the Sharing icon in the System Preferences window. 3. Make sure you've entered a name that you can easily recognize in the Computer Name field. 4. 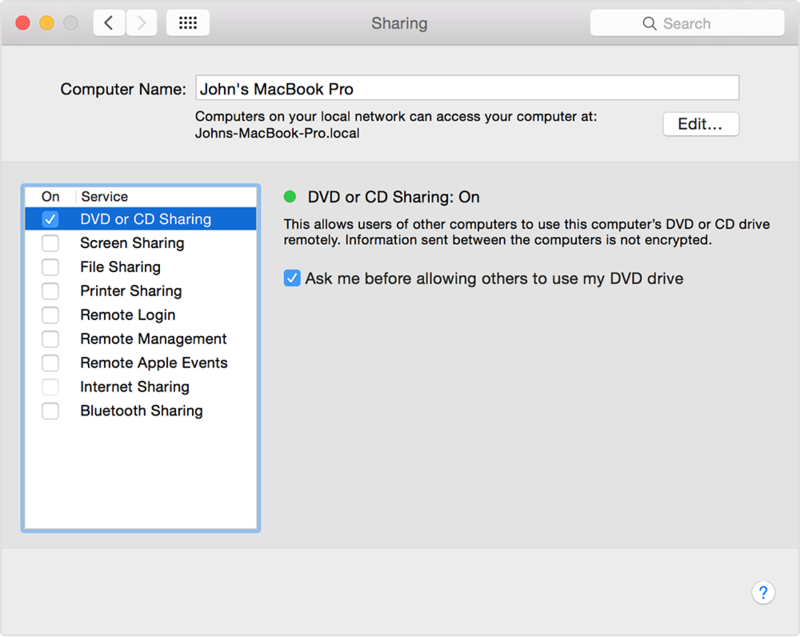 Enable the checkbox for DVD or CD Sharing. 5. You can also restrict who has access to your optical drive by selecting "Ask me before allowing others to use my DVD drive." Users don't need to buy external disc drive to play DVD on Mac mini. Require another computer that equipped with optical drive. Remote disc can be very slow over a network. Not all types of DVDs are supported. No one wants to carry a hard drive around to play DVD on Mac mini, and it can be a headache when your DVD player won't play DVD on Mac mini, for example, damaged DVD not playing, no disc found/blank disc error messages and other playback error, locked different region DVDs. You can rip DVDs to Mac mini for smooth and easy playback. EaseFab DVD Ripper for Mac is a great option for the job. It can copy and digitize DVDs to MOV, MP4, M4V etc. supported format for DVD Player for Mac mini, like QuickTime, VLC with untouched quality in mins. With the DVD ripper for Mac, you can play any DVDs on Mac mini, including new releases, damaged DVDs, workout DVDs, Japanese DVDs that cannot play correctly before on Mac mini without disc drive. 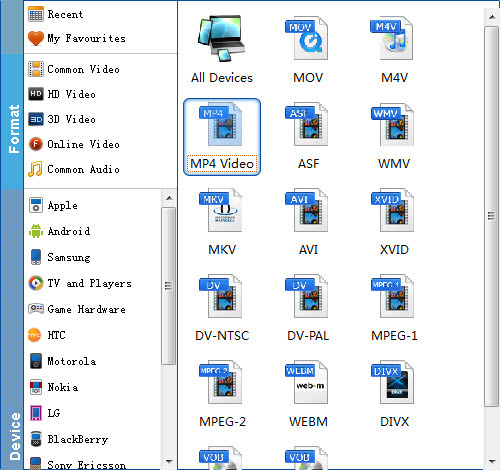 Now you should choose MP4, MKV, MOV as the output video format. Now all you need is pressing the "Convert" button to get the entire process accomplished. It's worth mentioning that the Intel QSV, HT tech, Multi-core CPU support makes the program the fastest DVD ripper - rip a DVD in 5 mins. Now, you can play DVD on Mac mini anytime anywhere without worries about DVDs not playing on Mac mini. need no disc drive any more to play DVDs on Mac mini, play every and any DVDs without hassle, including damaged/unplayable DVDs, TV series/new movies on DVDs, workout/AV discs, perfectly get rid of Mac mini won't play DVD issue. have to download the software and rip DVDs to Mac mini first. QuickTime, VLC won't play DVDs on Mac mini. For example, when playing some DVDs, like workout/exercise DVDs, Japanese DVDs, AV DVDs etc. with VLC in Mac min, DVD can't load, or it shows unplayable blank DVD disc folder. The Mac mini won't play DVD error can be solved with the help of best DVD ripper that comes with DVD analysis tech and right title check mechanism, and can rip these unplayable DVDs to MP4, AVI, MOV, etc. supported format by VLC on Mac mini. Check if your DVDs are damaged (if yes, copy damaged DVDs to solve not playing problem on Mac mini), clean both your DVD and disc drive. Reset the SMC (System Management Controller) on your Mac mini if you encounter DVD not playing on Mac mini after updating to a new mac OS. The Mac mini cannot play DVDs smoothly is properly caused by smudged DVD disc and dirty laser lens. Take a cleaning cloth and gently wipe the disc and drive and play the DVD on Mac mini to try again. It's also possible that your optical drive on Mac mini is just worn out and stops working.